As a business, always being available is extremely important. What you need is the ability to screen and direct calls. This is where Yodel and its virtual assistant take over. 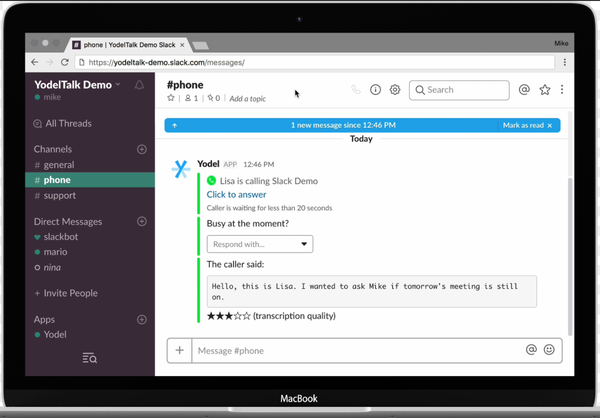 Yodel streamlines customer communication by allowing your business to make and receive phone calls directly from Slack – without any additional software. Yodel will supply your business with a local phone number you can add to your website. Not only does having a phone number on your website make you look legit, the Yodel virtual assistant will take the calls from inside Slack. 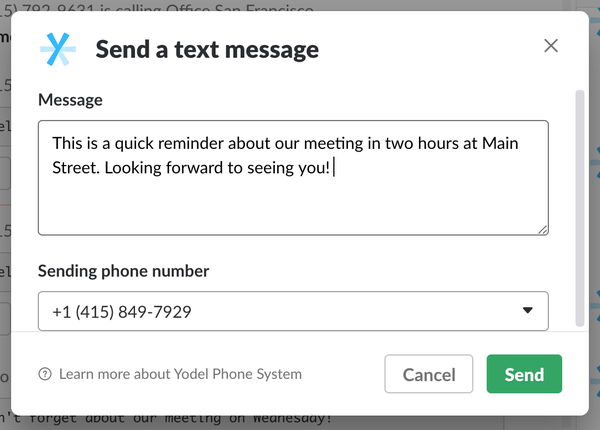 Send phone calls exactly where they need to go.Yodel lets you create custom greetings, take calls on browser or mobile, play music while customers are on hold, and receive voicemails which are transcribed and shown directly in your Slack. Yodel also sets each phone call up for success by using its Natural Speechfeature. This means that Yodel answers every call and asks why they’re calling. 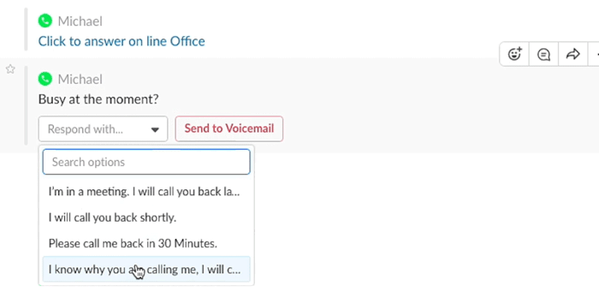 Calls are transcribed in real-time in your Slack, so you are always prepared — even for a 2 am “you up?” customer call. Yodel acts like a virtual receptionist: It understands what the caller needs and announces the call in the right Slack channel, so you only answer when you need to. With Yodel, you can send text messages directly in Slack!To make sure your business is successful no matter where it operates from, Yodel offers local phone numbers in over 100 countries—giving customers the impression you are right next door. Right now, people all over the world are using Yodel to reach their customers and run their business. If you wanted access to the Yodel Professional Plan, you’d be looking at spending $600/year for two users. Outbound calls: The equivalent of 500 mins per year to US and CA (USD 7). Additional minutes and international minutes are invoiced. But today, Sumo-lings, is your lucky day. Because today, you can grab lifetime access to the Professional Plan with two users for just $49! That’s lifetime access for the price of one month! Click here to start taking phone calls on Slack now! Even if high school Spanish wasn’t your strong suit, Yodel can help you connect with an international audience by understanding and interpreting over 30 languages and accents. With Yodel, you can stay connected to your customers in your sleep — simply set up canned responses that respond for you when you’re not free to chat. Yodel makes life easier for both you and the customer. You can manage all of your calls in Slack, and your customers get a seamless communication process. Grab lifetime access to the Yodel Professional Plan for just $49! Grab your code right here! United States, Canada, Austria, Belgium, Czech Republic, Denmark, Estonia, Finland, France, Germany, Greece, Iceland, Ireland, Italy, Latvia, Lithuania, Poland, Portugal, Slovakia, Sweden, Switzerland, United Kingdom.